Like I mentioned here, I want to incorporate some more realistic setups for my physically based animation work. This is what I've come up with so far for my Jello simulator. I'm getting better at working with mitsuba, so this scene took a lot less time to setup than the champagne scene did. I think it's a good start, but I don't like a number of things. Mainly the wood texture looks really bad. I need to fix that pronto. The pitcher is also supposed to be red, and I'm going to cut that glass dish on the right. 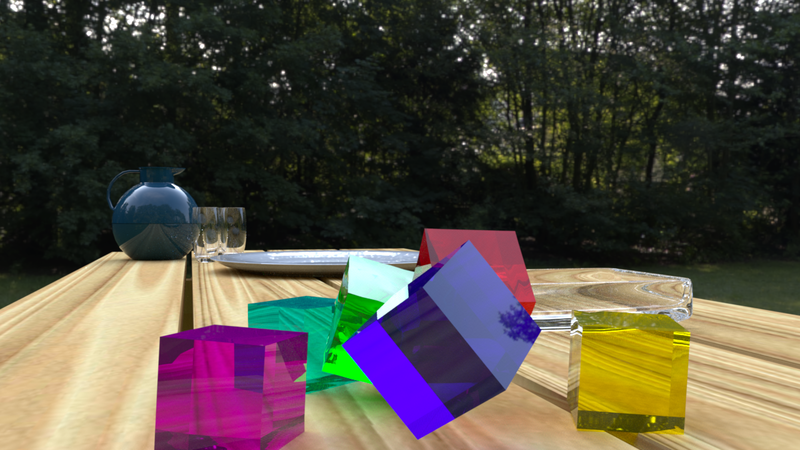 One neat thing about this is that it had Jello-Jello collision, which I coded up today to make this scene. It doesn't look 100% good, but I'm overall happy with the results.